Would it surprise you to hear that the best UJM on the market is neither Universal nor Japanese? As motorcycles have become more specialized, the idea of having one motorcycle for touring, commuting, gravel road riding and even track days seems quaint. Thirty years ago every manufacturer had a general-use bike. Honda had the CB, Kawasaki the KZ, Suzuki the GS and Yamaha had their XS. While the big four have moved on to dozens of models of specialized motorcycles, Moto-Guzzi has continued refining the bikes that made them a household name in the 70’s. This is the idea behind the Moto-Guzzi V7 Classic. OK, full disclosure: I love Moto-Guzzi motorcycles. I’ve logged over a quarter-million miles on everything from a 1972 V750 Ambassador to a 1998 EV11 with a few 850T models thrown in for good measure. This means that the odds were pretty good that I was going to like the V7 Classic before I even sat on it. It also means that I was pre-disposed to finding its shortcomings. That is the nature of Moto-Guzzi ownership. Moto-Guzzi has been making motorcycles in the same building, uninterrupted, since 1921. Only Harley-Davidson has been producing motorcycles longer. The iconic Moto-Guzzi flying V-twin engine first appeared in the US in 1967 as a 700cc model. It was imported in both civilian and police bike versions. Power equals heat and by putting the engine cylinders out in the airflow where they can shed heat, Moto-Guzzi was able to use more aggressive cam timing and a higher compression ratio. Add in the smoother-running 90º V with its much lighter crankshaft and it’s easy to see why the 1967 Moto-Guzzi V7 was able to out-perform the 1200cc Harley Shovelhead, the premier big twin of the day. In the end, Moto-Guzzi got the contract and the bikes from Mandello del Lario have been sold in the US every since. In 1974, the transmission gained a fifth gear and by 1985, the 700cc big-block engine had grown to 967cc on the way to its present 1067cc form. The styling of the modern V7 Classic is nearly identical to the 1972 V7 Sport. While the original was powered by a 750cc version of the big block engine, the modern V7 Classic runs a small-block platform that debuted in 1979 as a 500cc engine. The small block uses a Heron head design meaning the valves mount flush to a flat-surfaced head, perpendicular to the bore, and the combustion chamber is in the dished piston. Over the decades the small-block has grown as large as 850cc and has served Guzzi well. The original V7 Sport was the first civilian-use motorcycle that was capable of exceeding 200 kph (124 mph) in stock form. The new 750cc V7 Classic won’t match that top speed but will exceed the ton and happily runs at 80 mph all day long. V7 Classis is still classic 1972 in its feel. Visually it is clear that Moto-Guzzi knows more about vintage styling than any company short of The Motor Company. From its slightly upswept chrome mufflers to its chrome-ringed speedometer and tachometer, Guzzi knows classic style. The V7 Classic does many things well but its greatest strength is its ability to draw a crowd. Everywhere I went strangers would come up to ask about it and compliment the bike. “What year is that?” and “Wow, that sure is a pretty motorcycle” being the prevailing responses. The V7 Classic received plenty of “thumbs up”. Nothing short of a sidecar rig draws admirers like the V7C. This is not a bike for introverts or herd followers. 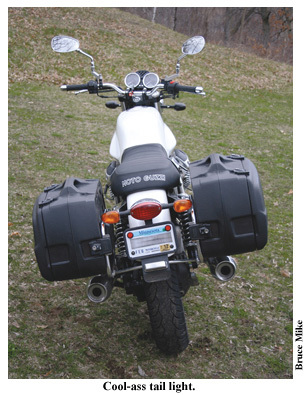 Gas stops often included a “Guzzi Delay Factor”. Editor Pearman dropped off the Classic with specific instructions to “Really ride it”. To me, that meant a loop around both Bigstone Lake and Lake Travers along the Minnesota and South Dakota border. Sitting on the bike for the first time, the V7 feels far lighter than its 435 wet weight. It is tidy and sized perfectly for my 5 foot 11 frame. I filled the 4.5-gallon tank with 91-octane fuel and headed out. I rode north alongside Bigstone Lake taking advantage of the Classics light weight. Once tucked in, I leaned the Goose into corner after corner, back and forth, flicking it side-to-side, enjoying the wonderful balance of power and weight. I am convinced more than ever that it is more fun to ride a “slow” bike fast than a “fast” bike slow. To have this much fun on a cutting-edge supersport would surely mean jail time if caught. On the V7, carrying speed smoothly through a corner is rewarding and effortless. Leave the “point and squirt” riding to the squids. This is a machine for adult riders who can remember the simple pleasure of a simple motorcycle. No fairings, no cutting edge technology, just an air-cooled pushrod V-twin, tubular handlebars and a bench seat. Wring the throttle and the V7 responds smoothly with broad power that peaks at 5,400 rpm before tapering off as it heads towards the 8,000 rpm redline. Wind it up to 6,000 rpm and let the rpm drop into the meat of the power band with each upshift. Though the accessory center-stand limits the lean angle in left corners I was well into go-to-jail speeds before any hard parts touched down. The non-adjustable 40mm front fork works far better than its low-tech appearance would indicate. High-end, fully-adjustable suspension components would be nice, but would add at least a thousand dollars to the sub-9,000 dollar price tag. In back, a pair of pre-load adjustable coil-over shocks does an admirable job of controlling the ride. There is no noticeable shaft-jacking from the shaft rear drive; just clean, fuss-free power delivery. The brakes are top shelf. A single floating 260 mm rotor in front and back with four-piston calipers make two-finger stopping the norm. The frame design may be vintage 1979 but the three decades of development have been well spent. The engine is a stressed-member and makes for a stiff, light and simple package. This is by far the most refined 1979 motorcycle I’ve ever ridden, even more so than the current Sportster line which debuted in the mid-80s. The large stylish mirrors do a fine job of making sure that no elbows or shoulders sneak up from behind. Those riders wanting to see actual traffic behind them will want to spring for a set of mirror extensions. Foot and hand controls are instantly familiar. No odd blinker switch placement, no wonky lever or peg angles. Just simple, uncluttered controls just like every UJM had in the 70’s. Even the current industry norm of “hide the key switch” has been avoided. The ignition switch resides right in the middle of the gauge cluster as God and nature intended. Be warned though: long break-in periods are standard procedure for any Guzzi. Their engines and transmissions are built exceptionally robust. Some say agricultural. Expect the bike to run and shift even smoother once 20,000 miles have rolled beneath its wheels. With basic maintenance, Moto-Guzzi engines will happily run hundreds of thousands of miles. Living with the Classic is easy. Fuel economy was 45 mpg though I would expect that to improve as the engine breaks in. Valve settings are barely more complex than oil changes and take only slightly more time. The transmission uses a single-plate dry clutch and fifth gear is a true over-drive with a 0.9-to-1 final ratio. The engine and transmission do not share an oil supply. Gear lube is used in the transmission and rear drive while dead dinosaurs go in the engine sump. Even the headlamp works as a modern headlamp should. No romantic orange glow to lead the way home, an impressive reflector holding a H4 bulb lights the path nicely. The Flying-V engine design runs cool. Anyone expecting to warm themselves off of the heat from those exposed cylinders will be greatly disappointed. 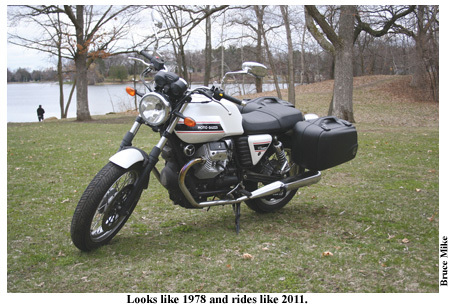 When my time with the Moto-Guzzi V7 Classic ended, I was sad to see it go. I loved its balance of power, torque, styling, comfort, handling and over-all feel. It’s all about the balance. Not too much power, not too heavy, not too light and not too complex. It just feels “right”. It is not a bike for everyone though. Those that live and die by the spec sheet will never understand how a bike that puts only 38 horsepower to the ground can be so much fun. Riders that appreciate a simple, basic motorcycle will feel instantly at home on the V7C. It has all the perks of a vintage motorcycle with none of the oil leaks or dodgy electrics. The V7C surely will be a Classic. “That new guy” Bruce quietly pacified our friend with an MMM sticker and we sent him on his way, but his remarks set me to thinking. A quick check of the morgue shows that in seven of the past nine issues, we have reviewed two-cylinder machines. Sorry to disappoint you, friend, but twins are the thing. Blame our own Paul Berglund. Since purchasing his first KTM in 2008 (950 SM), he has incessantly preached the two-cylinder gospel. This month is no different as we celebrate the Moto-Guzzi V7 Classic. The V7 is a looker, styled after the iconic, Tonti-framed V7 Sport of 1971. A café racer fuel tank (4.5 gallons) is tucked in front of a wide, comfortable bench seat. Other period styling cues include chrome-spoked rims; twin coil-over shocks and round analog gauges set in front of a chrome tubular handlebar. Rest assured, the V7 Classic is no slouch. Moto-Guzzi has fused modern running gear into this handsome retro package. Fueling is by Weber-Marelli EFI and became spot on once the Cal emissions crap was binned. Come and get me, coppers. Brakes are semi-floating drilled discs pinched by Brembo calipers. A 330-watt alternator juices the quartz halogen bulbs. The initial impression is of a compact machine that is both light and agile. The low, 30.5-inch seat height accommodates most riders. The V7 carries its 443 pounds (curb weight) low. For comparison, that is 49-pounds lighter than a Triumph Bonneville and over 100-pounds lighter than a Harley Sportster. The Moto-Guzzi V7 is extraordinarily easy to maneuver and park. Slide the fast idle lever toward you, turn the key, listen to the fuel pump while you watch the gauges perform their warm-up act and thumb the button. The motor settles into a staccato baritone idle that settles down quickly. Squeeze the clutch lever; engage first and you are off, the Lafranconi exhaust ringing in your helmet. Clutch is cable actuated and is very light. You can ride all day and not grow weary. Levers have a bit of reach and are non-adjustable. Shift action is light, but has a long throw. If you aren’t careful when really working the gearbox, you can miss a shift. Loyal Guzzitisti will tell you that shift action actually improves with miles. The venerable gearbox design has been around for decades and will outlast you. Great swaths of the cycle parts are blacked out. No doubt a concession to cost; the black is a visual contrapunto to the luminous pearl white paint. The driveshaft is completely concealed within the blacked-out, cast alloy swingarm. The V7 Classic lacks the torque-compensation parallelogram linkage of its bigger brothers. Moto-Guzzi claims that it is unneeded with the V7’s power output, but you can feel the rear end rise when you get on the throttle. Owners will quickly learn to compensate for and ignore this quirk. No matter, the simpler swingarm saves cost, reduces mass and is in keeping with the retro look. The view from the seat is terrific. A chrome tubular handlebar brackets a round tach and speedo. An LCD window within the speedo displays odometer and trip meter functions. The tach window displays either time or temperature. Functions are cycled with two glove-friendly chrome buttons that complement the bright chrome bezels that adorn the gauges. Leading the way is a retro-cool chrome headlight bucket. While I love the look and lines of the single headlight, its performance is adequate at best. I re-aimed the lamp and ran with the beam on high. There is a reason most modern machines have two headlights. The usual idiot lights live between the gauges. You get lamps for high beam, blinker, low fuel, neutral, oil pressure and a mysterious engine icon lamp that glows ominously for two seconds after start-up. My second gripe with the V7 Classic is with the low fuel light. As fuel gets low, it comes on and the fuel tripmeter starts counting up. So far, so good. But then the fuel will slosh and “wipe” the low level signal. This pattern occurs for 15 miles until at about 155 miles since your last fill-up, you get low enough that the lamp stays on. I chose instead to rely on the tripmeter. 150 miles: think about gas. 170: find gas now. The wide, bench seat is comfortable. You can easily ride out a tank without strain. I miss bench seats. Seat height is 30.5-inches. I could easily flatfoot it at stops and while parking. Passenger X found the rear accommodations to be fine, even after one 60-minute stint. Foot pegs are relatively high for both rider and passenger. While I appreciated the greater lean angle possible, riders with longer legs may get grumpy. The V7 Classic runs and rides way better than it would appear on paper. Mass is carried low and central. It is ridiculously easy to ride. If you have ever ridden a machine that fatigues you with its porky mass or sluggish handling, try the V7. It steers and handles like a bike of half its mass. With its 2-valve, pushrod motor, its not likely you’ll be first on race day. But the small block Guzzi V-twin is a proven power plant that will provide tens of thousands of trouble-free miles. But it is the way this motor works with the bike that delights. Keep the motor above 3,000 rpm, and there is ample torque to propel you forward, pass cars or just make music out of the twin Lafranconi pipes. The V7 Classic can be described as the unholy child of a Ducati Monster and a Harley Sportster. You get good looks, tight fueling and responsive brakes as in a Ducati blended into a cohesive visual package that echoes an earlier era a la H-D. This machine looks old but runs new. The Moto-Guzzi V7 Classic lists at $8,790 and includes a 2-year, unlimited mileage warranty. The V7 makes for a perfect city bike. She is easy to wheel around and park. Throw on a set of bags, add a small windscreen and enjoy a light tour. The power output from the 750cc V-twin is strong enough to take you and a friend but not so beastly as to scare off newbies. Lastly, her classic Italian good looks garner compliments from riders and non-riders alike. Everyone likes the V7 Classic. The bottom line? I liked this machine so much I bought it. I have owned seventeen street bikes since I started riding in 1982 and ridden and/or reviewed scores of other machines. While I can find something I enjoy about every motorcycle, it takes a lot to make this grizzled curmudgeon open his wallet. For this reviewer, the Moto-Guzzi V7 Classic perfectly balances style, function, performance and handling. After almost a year and 5,000 miles, I still love it. Low mass and wide bars make for effortless handling. Mercurial fuel warning light annoys. Retro single headlight is adequate at best. Foot pegs may hinder longer legs. DUCATI Sport Classics, TRIUMPH Bonneville family.